In August of 2012, The New York Times did brief audio interviews with NYC residents across the five boroughs, asking them for their views on the NYPD’s stop and frisk policy. One White woman stated, “I highly believe in the stop and frisk. I don’t care what color you are. We hear the African American and Spanish society complaining about it. The White people don’t complain! If you stop me, you stop me, give me a ticket, frisk me, do what you gotta do. It’s a difference of how everybody looks at it. I’m sure there’s a lot of White teenagers that get pulled over and stopped–they just don’t make the big public nuisance that other people do. And it’s not being prejudiced. It’s just seeing things the way they are” . In fact, that’s not the way things are. White teenagers are not being pulled over in numbers anywhere near those of Black and Latino youth. The overwhelming majority of individuals who are subjected to NYPD stop and frisk procedures are Black and Latino people (especially males, but not just youth). If in fact “White people don’t complain”, it is because with regard to stop and frisk, White people have little to complain about. The frequent experience of being surveilled, stopped, and searched by the police–and the feelings of humiliation and dehumanization that accompany those stops–belongs primarily to Black and Latino New Yorkers. The policy also creates mistrust, doubt and fear of the police, particularly because of a history of racial profiling and major incidents of police brutality . Stop-and-frisk (or, the official NYPD name, “Stop, Question and Frisk”) is “the practice by which an NYPD officer initiates a stop of an individual on the street allegedly based on so-called reasonable suspicion of criminal activity” [2, p.1], and during which frisking (searching) may also occur. Although the name stop and frisk implies one procedure, stopping someone and frisking someone are two separate acts, and each has its own level of required legal justification. If a police officer stops someone, she or he must have “reasonable suspicion the person has committed, is committing, or is about to commit an unlawful act." If the officer wants to frisk that person, she or he must have "reason to believe the person stopped has a weapon that poses a threat to the officer’s safety, a higher and more specific standard [3, p.8]. Those legal requirements are not being met when hundreds of thousands of people are being stopped. There were 685,724 stops in 2011, and of these 53% were Black, 34% were Latino, and 9% were White . The huge number of stops has increased every year. For example, there were approximately 97,000 stops in 2002, but by 2006 there were more than 506,000 . The most frequent reason (more than 50%) for stops was "furtive movements” , which is too vague to clearly indicate the suspected criminal activity. Below are statistics over the past several years. –In 70 out of 76 precincts, Black and Latino people accounted for more than 50% of stops, and comprised more than 90% of stops in 33 precincts. Even in precincts where the numbers of Black and Latino residents are very low (e.g., 8% in the 6th Precinct in Greenwich Village), they were still more than 70% of stops in six of those precincts . –Black and Latino males ages 14 to 24 are 4.7% of the city’s population, but they were 42% of stops in 2011. In fact, there were more stops of young Black men (168,216) than there were young Black men in the city (158,406) . –Among stops in 2011, 88% did not result in an arrest or summons . Between 2004 and 2009, only 5.4% of stops resulted in arrests, showing that the vast majority of stops were of people who had done nothing wrong . –In 2009, more than half a million New Yorkers were stopped, and 87% of them were Black and Latino . And in almost 36% of stops, officers did not list an acceptable suspected crime . –As noted above, frisking can only legally take place when the officer reasonably suspects that the person has a weapon and could endanger the officer’s safety. But 56% of people who were stopped were frisked, and a weapon was only found 1.9% of the time . –As with stops, Black and Latino people (58%) were more likely to be frisked than White people (44%)–but less likely to be found with a weapon . –Whether or not frisking takes place depends a great deal on what precinct it is. Officers in the 46th Precinct (the Bronx) frisked people 80% of the time, but officers in the 17th Precinct (East Side of Manhattan) frisked people 28% of the time . This suggests that officers are making those decisions on something other than standardized legal guidelines. –Cases where officers used physical force (e.g., putting the suspect on the ground, drawing a firearm or batton), are more likely to involve Black and Latino people . –The NYPD contends that stop and frisk is justified and important to getting illegal guns off the streets. But each year, less than 1% of stops produces a gun. In 2003, 1 gun was found for every 266 people stopped. In 2011, even though hundreds of thousands more people were stopped, these numbers only produced 1 gun for every 2,982 additional people that were stopped . Put another way, officers stopped approximately 161,000 stops in 2003 and obtained 604 guns. In 2011 they stopped more than 685,000 people, but only obtained 780 guns . –Only about 6% of stops lead to arrests, but officers do frequently write summonses for “disorderly conduct” and other minor infractions . If those infractions result in fines, they can cost hundreds of dollars, making it hard for poor families to pay. And, people who do not appear in court to face judgment or pay fines can end up with a bench warrant. This means the next time they are stopped on the street, the warrant will lead to being handcuffed and taken to jail . –The NYPD also contends that Black people are disproportionately stopped because they commit most of the violent crime in the city. However, approximately 90% of people stopped are for reasons other than violent crime. Also, violent crimes are less than 10% of all crimes in the city, and almost half of violent crime complaints do not include the suspect’s race at all . –Researchers have determined that Black and Latino people were stopped more frequently than Whites, in comparison to their overall population, and after controlling for estimated rates of crime by race and ethnicity, including violent crime . 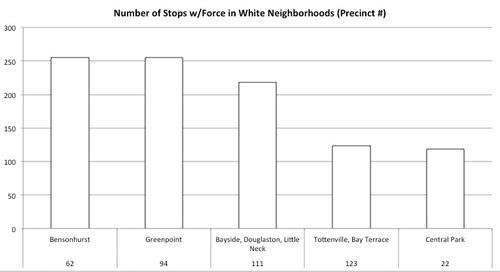 Below is a graph showing the disproportionality in stops compared to the city population, using NYCLU published data . Black and Latino residents are a huge proportion of those who are stopped, at rates much higher than their percentage in the city. For example, Black people comprise 26% of the city, but they are 52% of those who are stopped. On the other hand, White people are 47% of the population, but they are only 9% of those who are stopped. 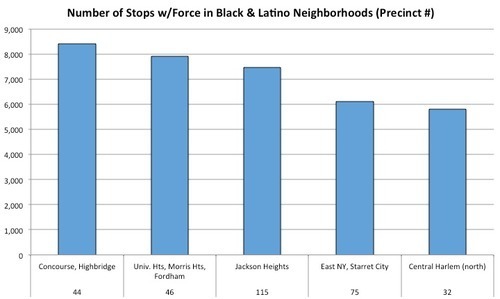 Below are two graphs showing the numbers of stops that involve physical force in predominantly Black and Latino neighborhoods (precincts), compared to the numbers in White neighborhoods (precincts), again using NYCLU data. As shown in the graph, the numbers are in the thousands in Black and Latino areas, but in the hundreds in White areas. 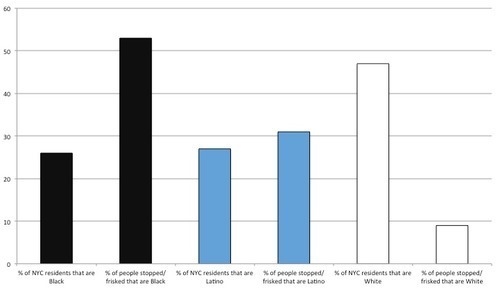 The NYCLU produced these analyses using the NYPD’s own data (the same is true with analyses by The New York Times, etc.). The data on stop and frisk is available to the public here:http://www.nyc.gov/html/nypd/html/analysis_and_planning/stop_question_and_frisk_report.shtml(requires the program SPSS). The NYCLU also has 2011 data here, in .CSV file format http://www.nyclu.org/content/stop-and-frisk-data, and includes a PDF file that defines the variables and codes in the dataset. The numbers in the poster (post above this one) come from analysis of the 2010 dataset, and are focused on Black people specifically (not including Latinos). These data are available as a result of a number of legal challenges. In 1999, the Center for Constitutional Rights (CCR) filed a class action lawsuit against the NYPD for stop and frisk policies that violated the Fourth Amendment (protection from unreasonable stops and seizures) and the Fourteenth Amendment (equal protection of the laws). The plaintiffs sought damages and the dismantling of the Street Crime Unit (SCU), which was a commando unit of officers that worked in unmarked cars and plainclothes. In 1999, four SCU officers shot and killed Amadou Diallo, an unarmed African immigrant. While the case was in progress, the SCU was disbanded, and in 2003, New York City agreed to settle the case . The settlement required that the NYPD maintain a written anti-racial profiling policy, audit police officers and their stop and frisk record, provide the audit results to the CCR, provide public education, and more. Although the NYPD has provided the stop and frisk datasets, there has been significant non-compliance with other aspects of the settlement. That, plus a large increase in stop and frisk over the years has resulted in a new class-action lawsuit, Floyd et al., v. The City of New York, et al. (described more below). Although statistics that show the sheer number of stops are important, they are not the entire picture. It is also important to look at the manner in which these stops are conducted. Black and Latino communities are feeling under siege and harassed by the police . Interviews with New Yorkers who have experienced these stops describe them as part of daily life, as occurring without explanation or apology, and as making them feel belittled and like animals [10, 5]. One boy told The New York Times about being stopped and frisked at age 12, when he was barely scraping five feet tall. He walked out of his house, and crossed the street to a friend’s home. While doing so, he was stopped by police officers: “When I looked up, I see the cop. He was like, ‘You,’ and I was like, ‘Me?’ He said, ‘Yeah,’” Tyari recalled. “He said, ‘Empty your book bag,’ and I was like, ‘Okay,’ and I was taking my time. Then he said, ‘You need to hurry up.’ And he started emptying my book bag and dropped my stuff on the ground.” After taking him back home for identification, the officers left . Another eighth grader was stopped on his way to school by a jeep full of five officers who ordered him to put up his hands, threw his books on the floor and questioned him about drugs and gang members. He too was returned home, and his mother yelled at the officers, who then patted him on the head and said "My bad” . In an Op-Ed, Nicholas Peart recounts several serious and frightening incidents that have led him to incorporate “into my daily life the sense that I might find myself up against a wall or on the ground with an officer’s gun at my head. For a black man in his 20s like me, it’s just a fact of life in New York” . Julie Dressner and Edwin Martinez’ short documentary reveals the pain and anxiety connected to frequent stops . Finally, The Nation published a chilling account of an actual stop in progress. A Latino youth was able to record his stop live on his phone, and listeners can hear the physical aggression, racial epithets and humiliation he encountered simply for walking down the street: http://www.thenation.com/article/170413/stopped-and-frisked-being-fking-mutt-video. Also in the video, some NYPD officers describe the directives that come down from higher administrative levels to complete more and more stops, or else face sanctions and punishment such as poor reviews, more dangerous assignments, and ostracizing from other officers. Officers have reported that their colleagues had to attend remedial classes for those who fail to record enough stops and arrests . In 2010, the Village Voice published a series of recordings one officer made (without NYPD knowledge or approval) in 2008 and 2009 in such settings as precinct roll call. The recordings give a “behind the scenes” look into commanders’ instructions to increase stops, particularly at the end of the quarter or end of the year, in order to make certain quotas (http://www.villagevoice.com/2010-05-04/news/the-nypd-tapes-inside-bed-stuy-s-81st-precinct/). Clearly, 685,000 stops could not take place based on the individual predilections of single officers. 1. The NYC Council has proposed legislation to bring accountability to the NYPD. Called the Community Safety Act, it seeks to protect New Yorkers against discriminatory profiling and unlawful searches, require officers to identify and explain themselves to the public, and establish an NYPD Inspector General Office (http://www.thenation.com/article/170523/will-new-york-city-council-curb-stop-and-frisk-abuses#;http://changethenypd.org/community-safety-act). 2. Congressman José E. Serrano (http://serrano.house.gov/press-release/serrano-questions-ag-holder-%E2%80%9Cstop-and-frisk%E2%80%9D-and-civil-rights), NYC Councilmember Jumaane Williams and other elected officials have asked U.S. Attorney General Eric Holder to investigate NYPD’s stop and frisk policies. 3. Earlier this year, the Bronx District Attorney’s office told the NYPD that it would no longer prosecute people stopped for trespassing without clear demonstrations that the arrests were warranted. Trespassing arrests are a variation of stop and frisk, and had been made in public housing developments or under the Clean Halls program, where police officers patrolled the hallways of private buildings . The Bronx DA contended that it knew of people who had been arrested for trespassing despite being residents’ guests . For example, in Brownsville, residents stated that they were frequently stopped and or ticketed for entering their own or friends’ homes in public housing because they did not use a key–but that was because the front door lock was broken . 4. In September of 2011, Commissioner Kelly issued a memorandum stating that police were not to arrest people who were found to have small amounts of marijuana in their pockets after a stop . However, even though arrests dropped significantly after the memorandum, they increased 6% during the first eight months of 2011 . In June of 2012, Governor Cuomo proposed legislation for NY State in which the possession of 25 grams or less of marijuana in public view would be downgraded to a violation, instead of a misdemeanor . (5) Whether the City, Commissioner Kelly, and Mayor Bloomberg have encouraged and given official approval to stops and frisks that are unconstitutional. The case is set to begin trial on March 18, 2013. It remains to be seen whether the U.S. District Court will rule that the City and the NYPD are violating the constitutional rights of Black and Latino people in New York City. New York Civil Liberties Union . (2012). Stop-and-Frisk 2011 Report. Retrieved on December 12, 2012 fromhttp://www.nyclu.org/publications/report-nypd-stop-and-frisk-activity-2011-2012. The New York Times. Reform Stop-and-Frisk (Editorial). (2012, May 16, p. A26). Gelman, A., Fagan, J., & Kiss, A. (2007). An analysis of the New York City Police Department’s “Stop-and-Frisk” policy in the context of claims of racial bias. Journal of the American Statistical Association, 102(479), 813-823. Peart, N.K. (2011, December 17). Why is the NYPD after me? The New York Times.
. The New York Times. Losing Faith in Stop-and-Frisk. (Editorial). (2012, September 26, p. A28). Kaplan, T. (2012, June 4). Bloomberg Backs Plan to Limit Arrests for Marijuana. The New York Times. Newman, A. (2012, February 1). Marijuana arrests rose in 2011, despite police directive. The New York Times.